Join WGNSS for birds, bugs & botany! We will meet Thursday mornings at 8:00 AM May 3 thru October 25, 2018. Starting Thursday, November 1, 2018. we will meet at 8:30 a.m. The meeting place remains the same: at Des Peres Park, the parking lot at Ballas and Manchester Road -- the northeast corner behind Des Peres City Hall. Everyone is welcome! Bring a lunch and water as we usually have lunch in the field unless you plan to leave early. Binoculars, bug repellent, sun block and a hat or cap are suggested. We will normally return by 3 or 3:30 PM. Click here for complete WGNSS calendar. Contact Peggy Oates at troates@yahoo.com for details. 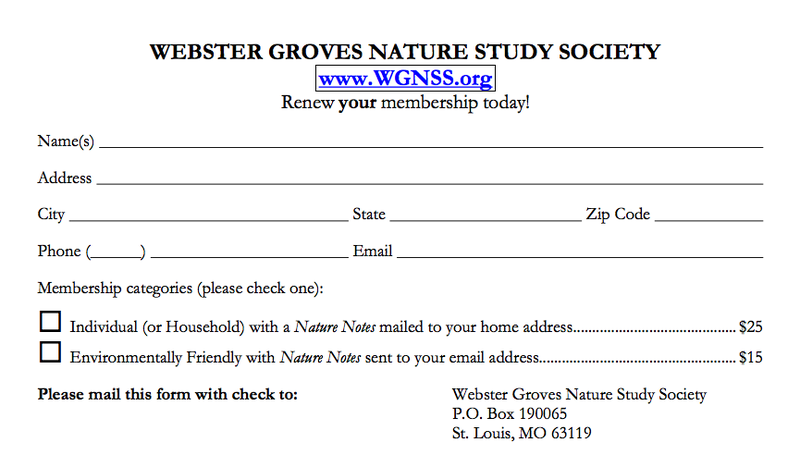 WGNSS trips are free and open to all! ​WGNSS event notices are posted on the WGNSS Facebook page. There are no fees for WGNSS trips. Click here for complete WGNSS calendar. Learn More about Birds and Nature Photography at these Nature Blogs! Forest Park Owls﻿. Mark Glenshaw observes and describes mated Great Horned Owls and the amazing range of wildlife found in Forest Park, St. Louis, Missouri. Al Smith. A birder and photographer shares his experiences and photos. Awesome! Gardening with Binoculars. Anne McCormack discussions bringing nature (especially birds) to your back yard! Getting Into Nature. Don Corrigan – Environmental Journalist and Nature Writer, and Professor; of Media Law, and Global & Environmental Journalism at Webster University. Author of Environmental Missouri: Issues and Sustainability-What You Need to Know (2014), and Show Me...Nature's Wrath: Tornadoes, Floods, Ice Storms, and Other Natural Disaster (2009). Jo Alwood's YouTube channel. Wonderful and informatively narrated videos of birds, insects, & nature! Another WGNSS member writes this fascinating site about the birds, butterflies and plants of Colombia. Find even more blogs by checking the links of the Nature Blog Network. colombianaturesite. A WGNSS member's fascinating blog featuring birds, butterflies, and plants of Columbia, South America. Sialis. This website provides a wonderful resource for people interested in helping bluebirds and other native cavity-nesters to survive and thrive. Find even more blogs by checking the links of the Nature Blog Network. Learn about Missouri and its Birds at at MoBirds. Birders around Missouri post their discoveries on the MoBirds Listserve sponsored by Audubon Society of Missouri. Current MoBird Listserve posts for bird rare bird sightings in Missouri are available at Birding News from American Birding Association (ABA). The ABA site has all the latest about Missouri birds, as well as recent posts on Twitter! Joshua Uffman maintains comprehensive complication of Missouri's Bird Records. Ever wonder what rare species have visited our state? Find out from ShowMe-Birds! 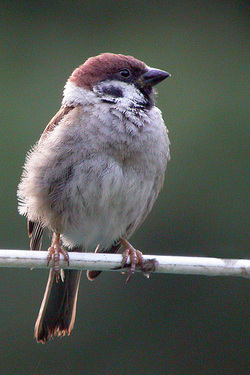 Here's more information on finding St. Louis's own Eurasian Tree Sparrow. St. Louis is the best place in the Western Hemisphere to see our WGNSS mascot, ETS! Here's a timetable of spring bird migration through Forest Park in St. Louis. Get a copy of Birds of the St. Louis Area: Where and When to Find Them, published by Webster Groves Nature Study Society, 1998. Missouri Field Guide A to Z provided by the Missouri Department of Conservation. Join the group for a birding field trip--destination? Where the birds are! Here's our calendar. Is it time to take down the hummingbird feeder? No, hummers need to put on some weight before they're ready for their migration across the Gulf of Mexico. Leave your feeder up, filled with fresh sugar-water at least into October. I leave mine up till it freezes! Thanks to Casey Galvin for the photos in the slideshow above: male Wood Duck, Lesser Yellowlegs, male Ruby-throated Humminbird , Black-necked Stilt. Anne McCormack had a chance to talk about the importance of Christmas Bird Counts with KPLR-TV's John Fuller in Dec. 2011. You'll probably recognize well-known WGNSS birder Paul Bauer in the video. View it on the Channel 11 website or on Anne's blog.